(GREEK NEWS AGENCA) Traditionally the “Christmas holiday period” in Greece lasts 12 days, until January 6 (Epiphany). 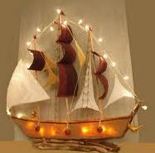 Lately, Greeks are increasingly choosing to decorate small Christmas boats (see picture) instead of trees. The modern Christmas tree entered Greece in the luggage of the country’s first king, Otto of Bavaria, who ascended to the throne in 1833 but the tree did not become popular before the 1940s. Still, Christmas in Greece maintains, in many respects, its originality, particularly in rural areas.